The Great War - how Fallout started and what lead to it. The Great War started and ended on October 23, 2077, when after years of armed conflict over the world's dwindling natural resources, the three remaining superpowers unleashed nuclear fire on each other in a swift and final conflagration. Most “official” records from the time have been lost, but according to survivor accounts, the exchange lasted about two hours, making it the shortest international conflict in history. The effects of the war, however, are still felt hundreds of years after the last bombs fell. The years leading up to the Great War were marked by increasingly brutal and desperate periods of conflict known as the Resource Wars. By 2050, most of the world's petroleum-based fuel sources had been drained dry by the insatiable thirst of the industrial nation-states, and their desperation to secure the remaining sources of fuel led to more wars and greater consumption of resources. For years, the United Nations tried without success to keep the peace, but its efforts were ignored. In 2052 the international body was disbanded and the Resource Wars officially began. In 2066 the Chinese sent armies to invade Alaska in an attempt to secure that state's oil fields. In reaction, the American government annexed Canada, ostensibly to secure Canadian support for its war against China, but mainly to pacify and distract its own increasingly unhappy population. In 2074, the U.S. initiated an invasion of mainland China, putting pressure on the Chinese army and eventually expelling it from Anchorage, Alaska. The Resource Wars finally ended in 2077 with The Great War. 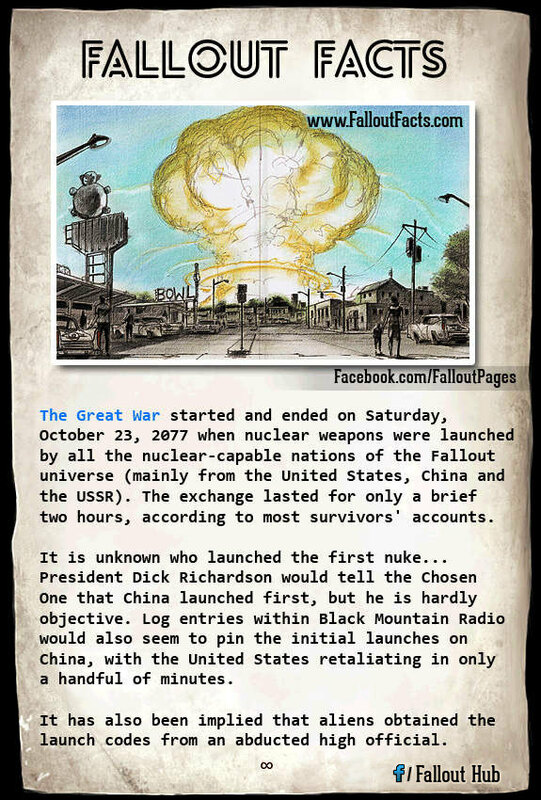 when to nuclear fire the Fallout world surrender. It's still unclear which side fired first in 2077. Unreliable US sources suggest the Chinese launched the first missile; it is highly likely Chinese records would say the same about the Americans. After all, neither side would want to claim responsibility for destroying civilization. What is clear is that in just two hours, more destructive force was unleashed than had been in the entire history of civilization. The Great War left the old world a radioactive ruin, and swept away the last remaining vestiges of the industrial societies that went before. The few that survived found themselves in a new world, hostile and unforgiving, where only the strong could survive.